We invented the Derminator® and produce it here in Europe. 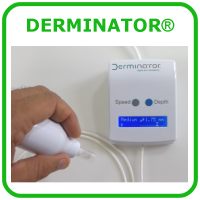 It uniquely has a digitally set, sensor-controlled variable needling depth and its motor is so powerful that the needles are so briefly inside the skin that this machine is the only one in the world that does not cause microtearing. Having the needles inside the skin only a small fraction of the time also means there is very little pain. 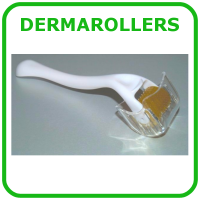 Dermarollers are the traditional dermaneedling instruments to quickly treat a large skin area. Our OwnDoc branded rollers come in three widths (normal, narrow and one-liner) and many needle lengths. Dermastamps are intended to treat smaller skin areas accurately. 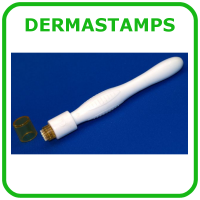 We carry large, medium and small size dermastamps. Not many creams and misc. 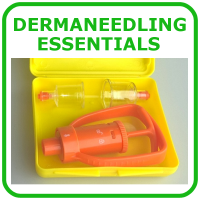 dermaneedling paraphernalia have scientific proof that supports they improve the dermaneedled skin. The products we sell do have such evidence backing them up. Silicone sheets against keloid and hypertrophic scars.